Resolution Obstacle Buster: What's Robbing You of Reaching Your Goals? Don’t let obstacles ROB you of your resolution success this year! Drinking less Saving More/Spending Less . . . . . and more! Enrollment is open until Monday, February 19th! Learn more by listening to the ROB Preview Call recording here! Do you make resolutions and then before January is over quit? Why? You don’t see results fast enough? You get stressed and need to eat/smoke/drink? You are going it alone and don’t have any support? which ROBs you of your dreams. a 12-week program beginning on Monday, February 12th, (Enrollment is open until Monday, February 19th) designed especially to help you bust through the obstacles that hinder your success. During weekly phone calls and online lessons, you will receive the information and support you need to help you uncover and eliminate your inner struggles, giving you confidence, motivation, and a clear path to attaining your personal goals. That is what makes this program successful – which makes YOU successful! Create a vision of what it is you want to accomplish and how your life will be once you do. Understand your Why and create a plan. Why do you want to fulfill this particular resolution, what day-to-day habits will you need to change in order to accomplish it and how to create a plan that will help you understand how to get there. Identify the obstacles that keep your goal at bay and whether or not, deep down inside, do you feel that you deserve to have what you want, which is one of the biggest obstacles to your success. Identify where the obstacles came from. In order to remove the obstacles we need to understand what happened in your life to create the obstacle that is limiting your success, and then use EFT/Tapping to remove the obstacles so that you can get over it and get on with it. Helping you to understand and overcome stress, which can be a huge obstacle to you keeping your resolution commitment. ROB will help you identify what your stress triggers are that then trigger you to overeat, reach for the cigarettes, keep you unorganized and prevent you from moving toward your goals. Shift mind-set tendencies of lack, another obstacle, to abundance. Along with not feeling deserving of what we want, many times we have to overcome feelings of lack. Shifting into a mind-set of abundance propels you forward toward resolution of your resolution. ROB guides you to the path of forgiveness. Because we know ourselves so well, we have a difficult time forgiving ourselves for every little thing we’ve done wrong in our lives which is a huge obstacle. Overcoming the obstacles to a successful resolution will also require positive thinking. Removing the obstacles helps clear the path to more easily incorporate positive thoughts and actions that will lead to your ultimate success! All of this is possible with the help of EFT/Tapping to quickly remove the obstacles and keep you moving forward. Four EFT/Tapping sessions are spaced throughout the 8 different lessons so that the obstacles that you are identifying through the course of the program can be addressed and released. Resolution Obstacle Buster helps you succeed because it identifies and releases the underlying root-causes of your obstacles vs traditional therapies and programs that only address the symptoms. 8 online lessons to help you uncover and bust through the blocks to your progress that make you feel like giving up. These lessons are packed with information and activities to help you identify and bust through the obstacles to your success. You will better understand the obstacles in your way and why they are there. 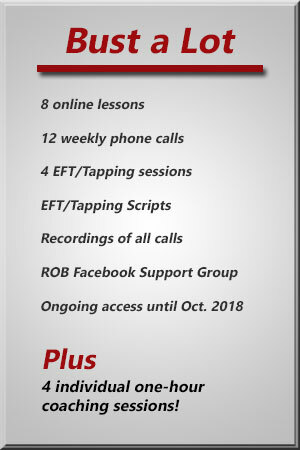 12 weekly phone calls: Eight calls to review the lessons and four EFT/Tapping calls. Eight of the weekly calls will help you to understand the lesson information and what the activities are designed to help you accomplish. The four EFT/Tapping (see below) calls help you to identify and remove the underlying root causes that keep you stuck in unwanted patterns. This is a powerful combination to help you succeed when other methods have failed. You will learn EFT/Tapping, a proven, powerful technique that will help you overcome your obstacles. You will learn EFT/Tapping a clinically proven, revolutionary technique that helps to release your negative thought patterns, stresses and anxieties that keep you stuck in unwanted habits. It is different than anything you have tried before and is known to work when other methods fail. It is fast, effective, transformational and long-lasting. EFT helps you feel less stressed, calmer and empowered which reduces triggers to unwanted behaviors enabling you to rapidly reach your goals. You will receive EFT/Tapping scripts to use in between the weekly calls to keep you motivated and dispel any fears, stress and discouragement that surfaces. Each ROB program phone call will be recorded and made available to you to download and review over and over again. You will have access to the ROB Facebook Support Group. This is a place to ask questions, share your successes, fears and obstacles that you are encountering and receive support, instruction, encouragement and reassurances. We’ve got your back! 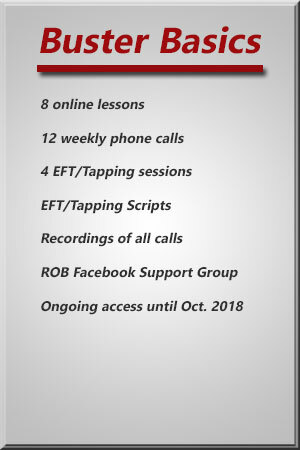 All of the lessons, EFT/Tapping scripts and phone call recordings will be online and available to you until the end of October 2018! You can review the information and recordings over and over again to ensure your resolution success. The weekly lessons, activities, EFT/Tapping, Facebook support group and recordings will help you achieve your goals and make your 2018 resolution dreams come true. You have a habit of setting goals and seldom reach them. You feel guilty and beat up on yourself when you give up. You always do it by yourself and end up feeling alone and isolated. You set goals too lofty to achieve and then quit. You expect the resolution to change your life dramatically and then are disappointed if it doesn’t happen. You never seem to find the time to fit what you need to do into your life. You decide on a resolution but don’t have a plan. You don’t really believe that you can do it. To feel successful – like you’ve accomplished something. To feel supported and cared about. To receive encouragement and recognition of your accomplishments. To have a plan and stick to it. but the only change that matters is the change that happens within us. 8 online lessons bursting with information and activities to help you bust through your obstacles. 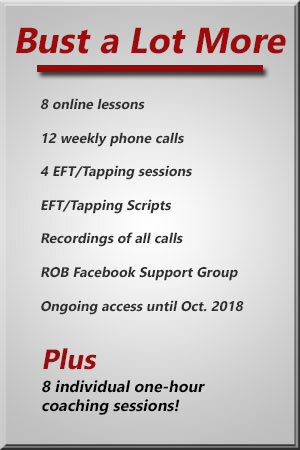 12 weekly phone calls: 8 calls to review the lesson information, activities and answer questions and 4 calls with EFT/Tapping to identify and remove the obstacles to help you be successful. EFT/Tapping instruction and guidance; a proven technique that can help you overcome the stresses and sabotaging thought patterns that hold you hostage in unwanted behaviors. EFT/Tapping scripts to use in between sessions to help keep you on track. Recordings of weekly phone calls so that you can listen to them again and again. ROB Facebook Support Group to answer questions and keep you motivated. Ongoing access to all of the ROB program information until the end of October 2018. Bust a Lot gives you more individual attention. Plus 4 individual one-hour coaching sessions! Individual EFT/Tapping sessions quickly uncovers the specific root causes of your unwanted behaviors enabling faster results and personal satisfaction. Bust a lot more gives you even more individual attention. Plus 8 individual one-hour coaching sessions! In this case more is definitely better! Eight individual EFT/Tapping sessions to thoroughly target and bust through your obstacles for optimum success. Which one is right for you to optimize your success? and to make them stick. 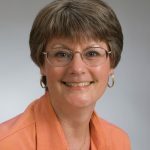 Christine Hunt is a Wellness Coach and a Certified EFT and Matrix Reimprinting Practitioner since 2013 who takes the whole person approach when working with her clients. She has helped her clients remove obstacles to their problems with weight, illness, pain, addictions, traumas, relationships, grief/loss and financial security, opening doors to their personal fulfillment and happiness. By addressing the origins of clients’ thought patterns and behaviors she helps them break undesired habits. Once the habits are broken, clients can make new choices and realize long-held hopes and dreams that positively transforms their lives. Christine helps you get over it so you can get on with it. If you are game, she can help you change. Now consider how your life will change when you are successful at achieving your resolution. What is that worth to you? Is it worth $500, $1,000, $10,000, more? When you consider the long-term benefits, how much does that save you in not only money but personal peace and joy? 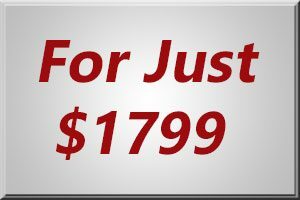 compared to the lifelong cost of continuing on your current path. Just choose from 3 different Resolution Obstacle Buster packages! You know you want a better life for yourself. You know something has to change to create that life. This is your opportunity to make that happen. You can stop trying to figure it out NOW! You did not come here to just click away from this page, to ignore it, pretend you weren’t here and throw away this opportunity. This is your chance to uncover the roots of why you can’t lose weight, quit smoking, drink less, have that perfect relationship, make more money, eat better, be fit, have more fun. is different than anything you’ve tried before and it works! Consider this a gift to yourself this season. You then become a gift to your family, friends, co-workers, neighbors and ultimately the world. you will feel the joy and satisfaction of success. One day or day one – you decide. 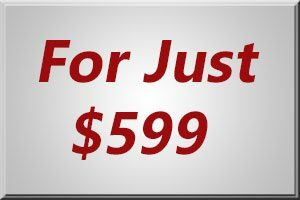 Pay all at once or use PayPal Credit to extend your payments for six months with NO interest.